Why? Because the stitches Jean Hilton created and made famous are involved and intricate and there is no better source available for understanding how they are done correctly. I own one of Jean’s book that diagrams the stitches she came up with but it is thirty years old. The newest variations aren’t covered and it is hard for me to understand in places. Computerized graphs have come a long way in 30 years. I am not good at counting so these intricate layered stitches are confusing for me. I need a lot of help. Twisty Stitches provides it. 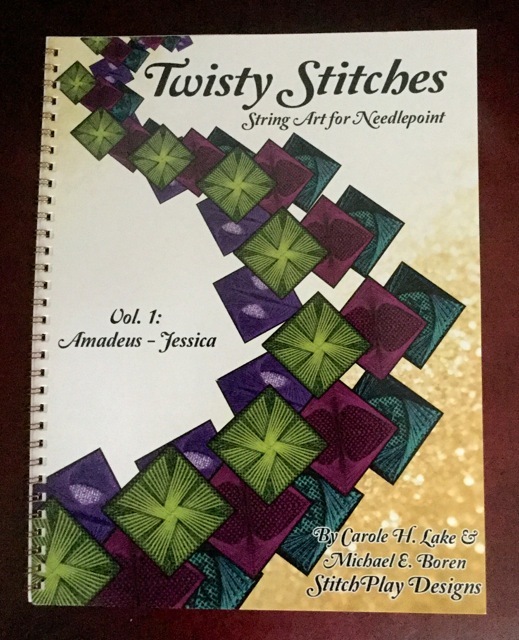 Carole and Michael’s Twisty Stitches Volume One covers how to work the Amadeus, Chilly Hollow, Crescent, Double Fan, Double Fan Doubled, Eight Point Star and Jessica Stitch plus a great many variations of each. For example, the Amadeus is diagrammed in 21 steps (with a numbered black and white diagram and 21 little color photos of stitched example of all 21 steps). There is also a color photo of the finished stitch and a color photo of the back side of the canvas when this is worked correctly. The only way you are going to understand this stitch better is if Michael and Carole are sitting on either side of you, cracking jokes and explaining what you are to do with each and every step that creates the arrow shape of an Amadeus Stitch. Then the book diagrams (also with a numbered chart and a color photo) seven variations of the Amadeus! The authors show you how to create an Amadeus heart, two triangles, a shorter and fatter arrow shape, a bat wing shape, and both a tongued Amadeus and a rounded Amadeus arrow. Plus there is a photo of the classic Amadeus so you can compare it to its seven cousins. If you do a lot of counted work, you will need this book. It’s going to make that stunning Threadles chart a lot easier to work and help you when you create a Walneto that just looks “wrong” to understand where you made a mistake. Well, Volume One doesn’t cover Walento Stitch but Volume Two (which will come out in September 2016) will cover it. If you only want to add an occasional Rhodes heart or Jessica Stitch circle to your painted canvas, you need this even more. These stitches are not often used on painted canvases so you won’t be familiar with them. Twisty Stitches covers them all (or it will when Volume Two comes out) so you can just grab the correct volume and go to town without hitting a barrier that is hard to overcome unless you have an experienced stitcher in your vicinity to help. Now for the details: The 8 1/2 x 11 inch book is spiral bound with a plastic covered cardboard cover and back for durability. 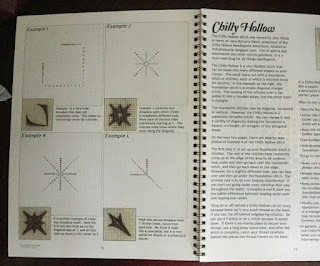 There is an introduction and two pages of Frequently Asked Questions about string art stitches with answers culled from Carole’s and Michael’s years as teachers of counted designs and painted canvas embellishment. The next 42 pages are diagrams and photographs, all large enough to see without squinting. There is a bibliography for those who like delving into more detail that includes a lot of reference material beyond Jean Hilton’s three books. There is no index but the final page is a photo collage of these stitches done in wildly colorful threads, which gives a taste of what you can do with color and string art combined. 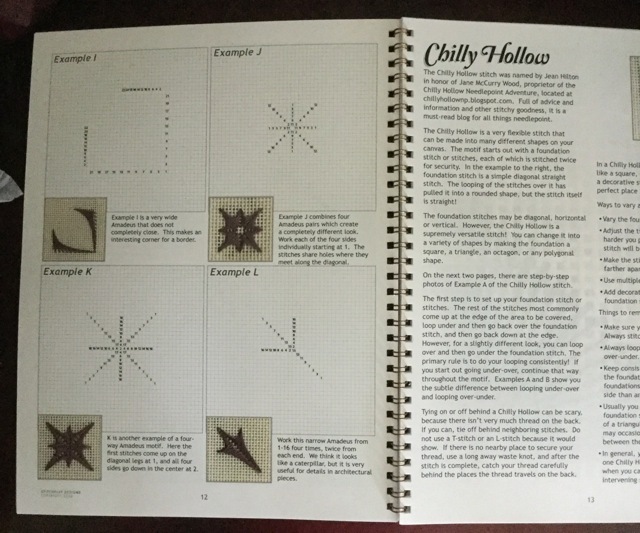 Any needlepointer who ventures beyond basic stitches–if only occasionally–needs this book. I am already saving up for Volume Two when it comes out in the fall. This isn’t a series I will use often but when I need it, it’s going to be a life-saver!